NFF General Secretary Musa Amadu says the federation cannot move into its recently-commissioned headquarters because of a cash crunch. Soon after the Sunday Dankaro House was commissioned, KickOffNigeria.com reported that the NFF would be unable to move in owing to its cash constraints. On Sunday, Amadu confirmed it to members of the House of Representatives Committee on Sports. 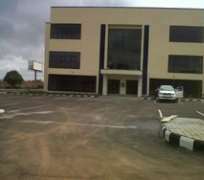 'Last year, we made a case to be given a capital N144 million to be used to furnish our new headquarters,' he said. 'The PTF graciously gave us a new football house which was commissioned in July. 'It has been well over two months and we have not been able to move a single chair into the building because it is a brand new one. 'We were surprised that not a single penny was voted for capital in the Federation's 2013 budget. 'So as much as we want to move into our new football house and conduct our business, we are constrained by resources,' Amadu said.